Chloride deicing salt stress usually coincides with the event of freeze–thaw, and the short-term adaptation of Dongmu-70 Secale cereale L. seedlings to these stresses was investigated in this paper. The chloride deicing salt and the freeze–thaw (FT) simulation experiments were carried out in the lab and alternation refrigerator. 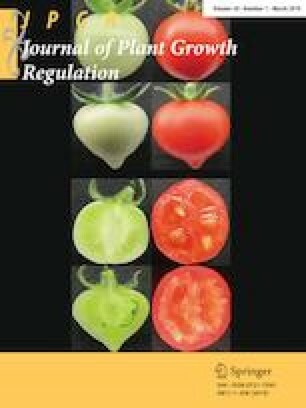 The changes of soluble sugar, soluble protein, relative conductivity (RC), malondialdehyde (MDA), and catalase (CAT) activity in seedlings were studied under freeze–thaw stress (10, 5, 0, − 5, 0, 5, and 10 °C) and 0, 200, 400, and 600 mmol L−1 of chloride deicing salt stress (CK, D1, D2, and D3). The results indicated that the content of physiological index in different treatment groups rose first and then decreased within a freeze–thaw cycle. During the recovery phase (T8: 24 h after freeze–thaw stress and T9: 6 days after freeze–thaw stress), there was significant difference either in MDA and CAT activity between D2 × FT and D2 or in RC, MDA, soluble sugar, and CAT activity between D3 × FT and D3. The seedlings showed different adaptability under different intensities of combined stress, and the sequence of the changes in physiological index can be patterned as D × FT > FT > D > CK. Freeze–thaw and chloride deicing salt complex stress exhibited a synergistic effect on the plant, which indicates that the snow-melting operation would be more harmful in spring and autumn to plants than in winter. Financial support from the National Natural Science Foundation of China (Grant No. 31772669) to Professor Bao is gratefully acknowledged. This work was sponsored by the National Natural Science Foundation of China (Grant No. 31772669).